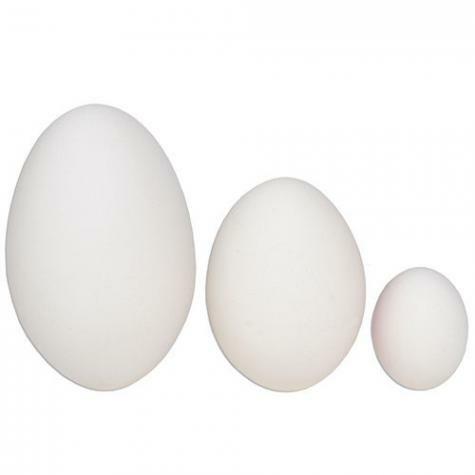 Sizes: Goose egg (3"), Chicken egg (2.25") and Quail egg (1.25"). Tired of birds laying eggs wherever they please? Nest eggs encourage egg-laying in the correct nesting area or nest box. Entice chickens, geese and quail to lay eggs in the proper nesting area. Place one egg per nest box. Mark eggs with a pencil to distinguish between real and and ceramic eggs. Innovative chicken nesting box is draft free, but ventilated to keep the hens warm in winter and cool in summer. Easy-to-clean and will not rot or rust. I purchased these Ceramic Goose Eggs for a craft project. Very easy to paint and work with. I realize this is not what they are intended for but I am extremely happy with them and will be ordering more. The whole ordering process was so easy and they arrived within a few days. I am a very satisfied customer. These ceramic eggs are exactly what we were looking for! They look good but the 3" eggs are smaller than real goose eggs. Need to be at least 1/2" larger. Not sure if they will work as replacement eggs. These are the realest looking eggs!